The American Basketball Association (ABA) crowned a new champion on Sunday, April 15th at Eckerd College in St. Petersburg, FL. And the Champion is the Jacksonville Giants team, advanced to the Final Series after eliminating from the race the San Diego Sol. Game 1 of the Finals needed of a typical ABA three-minute overtime, at the end the Giants overcame the South Carolina Warriors, 106-101, for the first time this season in three meetings. 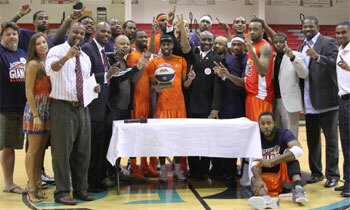 Game 2 was played yesterday night, and Jacksonville won again, this time 100-91, claiming the 2012 ABA title. The overall consensus of those attending was that these were the best two teams in the ABA.